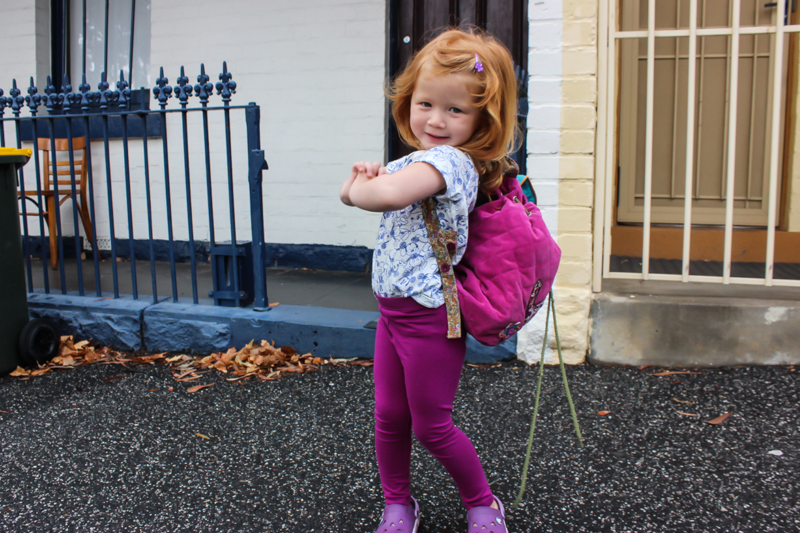 Lottie Cakes: This week you officially became a little girl in Kinder (preschool to most of the world, but Kindergarten in Victoria). We packed your backpack, jumped on a tram and I held your tiny hand as I dropped you off to a new chapter in life. You looked so big that morning, so grown, you spoke so clearly and sat on the tram bench like a girl ready to take on the world, without a care in it. You are still the youngest and smallest, being only 2 (for another week) starting 3 year old Kinder but you held your own as you always do and I knew you were ready. You yelled "I love you mom!" as I walked away and turned to your new friends and said"It's okay, she'll come get me later", which turned the tears in my throat to a giggle and I walked away after blowing you a smooch with a huge smile on my face. It doesn't seem Ill have to worry about you my fiery little lady, you're ready for anything! Ah she looks so excited to be going! Great milestone moment to capture.